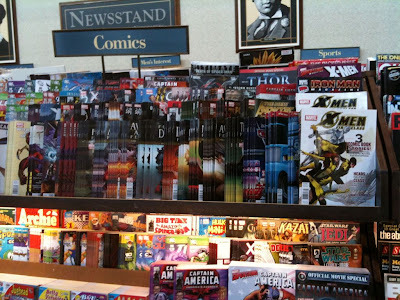 National bookseller, Barnes and Noble, is now devoting a considerable amount of magazine shelf space to newsstand comic books. So I've been collecting both direct and newsstand edition comics for about a decade now, and each year it gets harder and harder to find places that carry the newsstand versions. It's started to feel (I would imagine) like the days of prohibition when you had to give a secret password to enter an underground speakeasy to get your drink on. Newsstand comics are becoming a rare breed, which is what attracted me to collecting them in the first place. I realize that most comic book collectors have barcode blindness, and don't see a difference between a direct or newsstand issue. I didn't either for nearly two decades of collecting. But as I find myself completing the collection I have, I want to find new areas to branch into, and newsstand comics have been a blast. One of the better places to find newsstand comics in my neck of the woods has been Hastings -- a regional store that carries books, DVDs, toys and more. However, as of last year, they switched to being a Diamond customer and thus becoming one of the largest chains of direct edition comics and back issues. And their back issues are priced typically at $.99 or $1.99 each. You can find some nice stuff for cheap. Beyond Hastings, there is Books A Million (or BAM) and a variety of local mom and pop stores. BAM is reliable, but has a limited number of locations. It's great to support the local mom and pop stores, but their selection is limited. Now Barnes and Noble has entered the newsstand comics arena. I assume it represents a new channel of sales for their brick and mortar stores as the book market is slowly eaten up by online sales. But that's a story for another day. Anyway, all of the Barnes and Noble stores that I've visited over the last few months are now devoting several shelves in their magazine area to new comic books and comic magazines. And they are seemingly carrying most, if not all, newsstand titles released each month.